WATCHING TO THE NORTH: Weather radar this Thursday Evening shows a line of strong to severe thunderstorms to the north of the Findlay and Hancock County area. 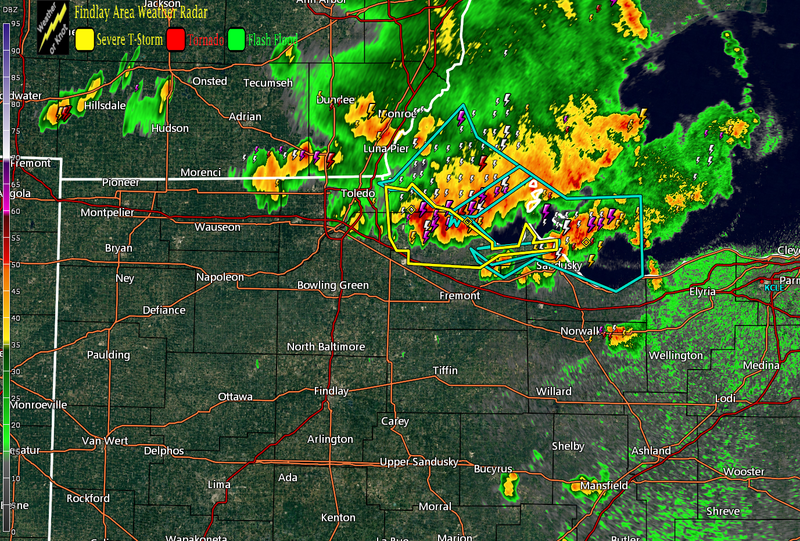 The bulk of this line looks to stay north and east of the area. One thing to keep in mind. We are monitoring development in lower Michigan that could move into the area later tonight. It will be remaining very warm and humid. Overnight low temperatures have a distinct possibility of not dropping below 70 degrees. FRIDAY FORECAST: The weather on Friday looks to be an instant replay of today. Most of the time there will be periods of plentiful sunshine. However, with the heating of the day, more scattered showers and thunderstorms are possible. While widespread severe weather is not in the forecast, excessive lightning, gusty winds, and torrential rainfall look to be possible. For the Friday night football games, you may have to dodge the scattered showers and thunderstorms. High temperatures Friday once again look to top out in the middle to upper 80s. Friday Night low temperatures are forecast to only drop back into the middle and upper 60s. THE WEEKEND: Saturday will be featuring continued chances for scattered afternoon and evening showers and thunderstorms. Those chances look to fade away Saturday night, and especially on Sunday. Plenty of sunshine is in the forecast for Sunday. It will be remaining very warm and humid. High temperatures Saturday and Sunday look to remain in the middle and upper 80s. Overnight low temperatures Saturday and Sunday Night are forecast to only drop back into the middle and upper 60s. NEXT WEEK: The start of next week will continue to feature warm and humid conditions. The next distinct opportunity for showers and thunderstorms looks to be at midweek as a cold front looks to move through the area. By Thursday of next week, temperatures are forecast to drop back some 15 to 20 degrees. That will also feature the next taste of Fall. 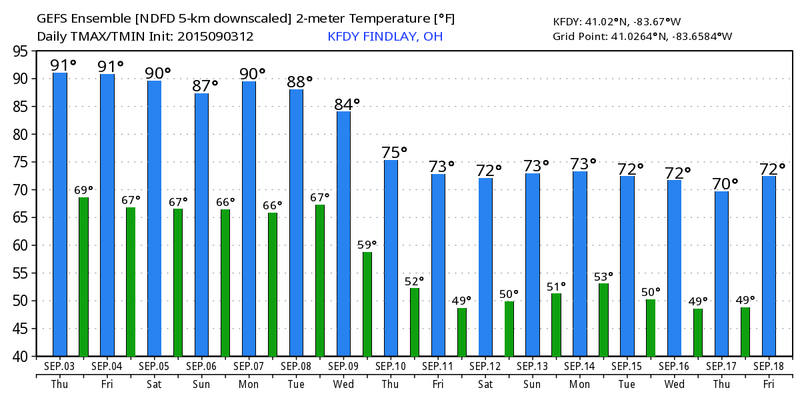 TRENDING COOLER: As we look into the next week to ten days, a distinct cooling trend is noted around the middle portion of the week. While we have had low temperatures stay above 70 degrees each night in the last week or so, the chance is there that we could struggle just to reach 70 degrees for high temperatures at the middle to late portion of next week. Look for the next Findlay Area Forecast Discussion sometime Friday afternoon or evening. Enjoy the rest of your evening!